Eight pages artist text project for ZX publication MIT, Aotearoa 2008. Every noun, proper-noun, group and collective nouns hand collated in the order in which they occur in Italo Calvino`s "Invisible Cities". This project has been published as a suite of page-works and also as a web- project. 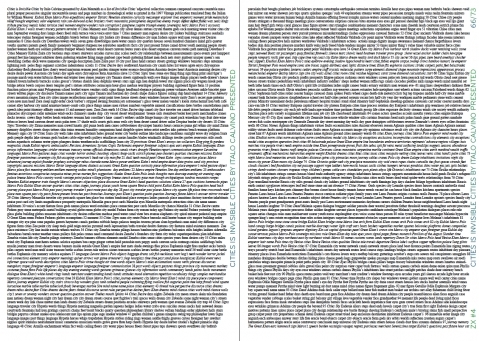 In the page-work version the list of nouns and page no`s from Invisible Cities is published at incrementally larger font sizes creating an almost imperceptable "zoom" or physical enlargement of the letters from page to page. Italo Cavino had once remarked that the written work had no capacity comparable to film to vastly enlarge a single detail. In the online project "Cities" the viewer could run the artwork (which originally resided on the Window website of the University of Auckland) that opened a small programme that ran auto-searches in alta-vista-image for each noun from Calvino`s Invisible cites in sequence. The search results were displayed to the user for 20 seconds before the programme booted the next noun from the novel to search results in alta vista.